Enjoy the open road in comfort and without worry. Airstream trailers have a signature look to them, silver polish and rounded ends, like a 1950’s diner on wheels. It is this look that helps to set them apart from the rest, and it is the quality of craftsmanship that we love the most. 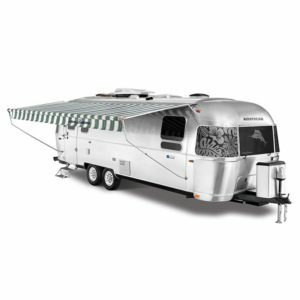 When you buy an Airstream trailer, you know it is going to last you a lifetime. They have become so multi-purpose now a days that people convert them into pop-up shops, food trucks and event trailers. If you haven’t been inside an Airstream recently we recommend you visit a dealer and check them out, whether you are trying out tiny living or just hitting the open road, the modern interiors have everything you could need. We recommend the Tommy Bahama! We love that this iconic piece of Americana has stayed true to its roots and continues to be manufactured in the good ‘ol U S of A. Shop for fun accessories, apparel and more online. Looking to get your own airstream, find a dealer near you.